Notes A close encounter with Jupiter in 1842 pulled this comet into a relatively short orbit through the inner Solar System. It was regularly observed from Earth over the following decades, but since its last detection in 1879 it has not been seen again. In 1842, Comet Brorsen passed close enough to the planet Jupiter that its orbit through the Solar System was radically changed, and the comet became trapped in the inner Solar System. Less than forty years later it was lost, and has not been observed since. 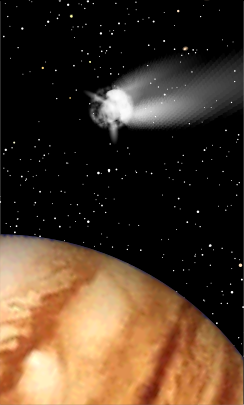 In May 1842, this comet made a close approach to Jupiter, passing within about 10,000km of the giant planet. That close encounter radically altered its path through the Solar System, locking it into a short orbit through the inner planets. Less than four years later, its new orbit brought the comet within range of observers on Earth, and it was discovered by the Danish astronomer Theodor Brorsen. Comet Brorsen's new orbit carried it past the Sun and back out towards Jupiter, returning to the inner Solar System over a period of five years and six months. The half-yearly element of its orbital period meant that it was not well synchronised with Earth's annual orbit around the Sun, so that it could not practically be observed on its next return. Rather, observerers needed to wait for it to complete two orbits (a period of eleven years) before it was well positioned to be studied from Earth. After the comet's discovery in 1846, these eleven-year observations were successfully made in 1857, 1868 and 1879. Following the same pattern, Comet Brorsen should have been seen again in 1890, but it failed to return. Searches for the errant comet continued for nearly a century, but it is now formally classified as 'lost'. The comet's ultimate fate is unknown, but most likely its nucleus simply evaporated, leaving an invisibly dark and inert rocky body continuing to orbit undetectably through the inner Solar System.